By submitting a grant proposal to RIR Cares, I was able to bring in a $3,000 donation to Richmond Community ToolBank (the big check is just for show, but we’ll put that on the wall at the new ToolBank facility). That was my first big donation secured, and I’m pretty fired up about it. Richmond Community ToolBank is very grateful to Richmond International Raceway for a $3,000 donation from RIR Cares during RIR’s Week of Giving! 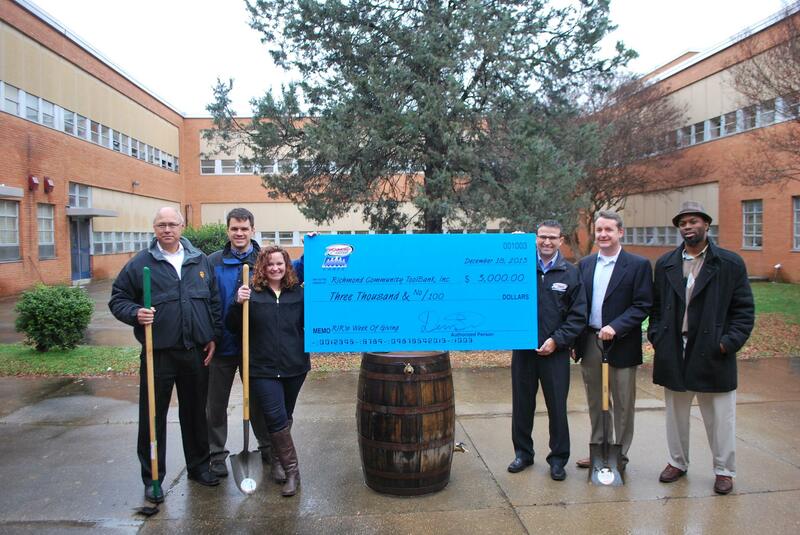 Dennis Bickmeier, President of RIR, was on hand at George Wythe High School today to give out a big blue check to Richmond ToolBank board members. At right is Duron Chavis of Rvafarms, who was instrumental in creating several student gardens at his alma mater, George Wythe H.S., using tools provided through partnerships with the Richmond ToolBank.